When it comes to conducting radio interviews, I always provide radio programs with my media sheet, which includes sample interview questions as well as short and long bios about me. This helps the host prepare for the interview, and makes sure they have the most up-to-date information available. Not every host will use your proposed interview questions, though in my experience, many are grateful to receive this information. Simply send it along once you’ve booked an engagement and be prepared for anything. The host may ask you a few questions from your list or none at all. Radio guests should be prepared to take curve balls! Your media sheet doesn’t need to be fancy, though including some graphic elements will help it stand out. I use a simple header with my photo, book covers and website URLs. The document is created and maintained in Word, though I save it as a PDF before sending it along. As a general rule, PDF documents look more professional. PDFs can also be read across all kinds of platforms including PC, Mac and mobile phones. The example I’ve included on the following pages is a media sheet I’ve used for years, based on one of my earlier books (From Entrepreneur to Infopreneur). I’ve conducted countless interviews on this topic and this media sheet has always been well-received. Also note that I continue to update it over the years so that it has the most current bio information. Stephanie Chandler is an author of several business and marketing books including From Entrepreneur to Infopreneur: Make Money with Books, eBooks and Information Products (John Wiley & Sons) and LEAP! 101 Ways to Grow Your Business (Career Press). Stephanie is also founder and CEO of AuthorityPublishing.com, which specializes in custom book publishing for non-fiction books. A frequent speaker at business events and on the radio, she has been featured in Entrepreneur Magazine, BusinessWeek, Inc, Wired Magazine, and many other media outlets. What are some ways that I can use information to benefit my existing business? How can I come up with ideas for my products? I have so many product ideas. How do I know which ones to work on first? What is the difference between an ebook and a special report? How hard is it to create an ebook? Can we talk about other types of products—teleseminars, tips booklets, workbooks, classes? Should I be paying attention to the competition? What are some ways to market my info products? What are the keys to info product success? Can you recommend some resources for those just getting started? Stephanie Chandler began her career in the fast-paced Silicon Valley, reaping the rewards of the Dot Com Boom, and surviving the turmoil of the Dot Com Bust. When she developed an ulcer before her 30th birthday, she knew it was time for a complete lifestyle change. Chandler fled corporate America in 2003 and opened a 2800-square foot bookstore in Sacramento, CA. She began studying online marketing strategies and the techniques she used quickly put her store website in the top three on Google, giving her business a competitive edge. A passion for internet marketing was born. Chandler launched BusinessInfoGuide.com, a directory of resources for entrepreneurs in 2004 and began writing business and marketing books. After building her bookstore into a successful operation, she sold the business and later launched Authority Publishing, a custom book publisher and marketing company. Details here include physical mailing address, phone numbers, and e-mail address. If an assistant or other representative handles initial media contacts, include their information here. Download my Sample Media Sheet. 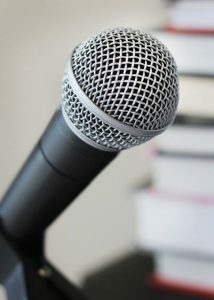 2 Comments on "How to Create a Media Sheet for Radio Interviews"